This memorable issue attempts to address some of the glaring continuity problems and plot holes created by the numerous changes in direction the Amazing Amazon had experienced over the previous few years. Almost every confusing continuity contradiction is cleverly explained away by writer Len Wein and editor Julius Schwartz . The issue also sets the tone for the next several issues, as Diana sets herself twelve ‘labours’ in order to prove to herself that she is still worthy to be a member of the Justice League of America. We also see the introduction of a new title logo. Superman, as his alter ego Clark Kent, had been reporting live via satellite on an address given by Pamanasian Prime Minister, Indira Gamal, at the UN building. Suddenly, heavily armed masked gunmen parachute down into the plaza and Kent is forced at gunpoint to continue his broadcast while the gunmen prepare to execute the ‘traitorous’ Indira Gamal live on TV! In front of the blaze of TV camera’s, Clark is unable to turn into Superman but prepares to use his heat vision to melt the assassin’s gun. Before he can react though, Wonder Woman sprints into the plaza and the surprised gunmen immediately open fire on the Amazon. She easily deflects their bullets with her bracelets and proceeds to disarm the shocked assassins. During the struggle however, one of the gunmen sees their chance to kill her while her back is turned, but Morgan Tracy, the UN’s trouble shooter, throws himself at the thug, knocking him to the ground. As Tracy prepares to pull the struggling gunmen’s mask off, Wonder Woman thanks him but explains that she already knew that ‘she’ was behind her. A puzzled Tracy wonders why she refers to the gunmen as a ‘she’ but when he pulls off the mask he sees that it is true! The Amazon Princess tells Tracy that she realised that all the assassins were, in fact, women as soon as she arrived on the scene but that she would leave it to him to discover their motive. With that, she runs off into the crowd. Prime Minister Gamal’s speech proceeds without a hitch and afterwards, Clark and his camera crew film the arrest of the female assassins. As a police officer ask Tracy to accompany him to the station to give a statement though, one of the women breaks free and snatches the officer’s gun, preparing to shoot Tracy. Luckily, the Amazon Princess, in her Diana Prince guise, arrives just in time to deliver a karate chop to the woman and disarms her. As the gang are led away, Morgan Tracy thanks Diana and she explains that they have met before. She reminds him that she is a guide at the UN and he asks her to consider leaving her position and work for him at the UN Crisis Bureau, where her considerable talents would be of great benefit. She tells him that she will consider the proposition and walks away. As Clark Kent and the camera crew begin packing their equipment away, Diana notices Kent and wanders over. Talking so no one else can hear them, she asks how he and the other leaguers are doing. He replies that they are all fine and then asks her when she had regained her ‘super powers’, since the last time they had met she was just an ordinary woman with skills in the martial arts? She stares at him puzzled, inquiring what he had meant by her super powers ‘returning’, since she had never lost them? The mystery deepens when a bemused Clark replies that of course her powers had been lost, as that was the reason she had subsequently resigned from the JLA! 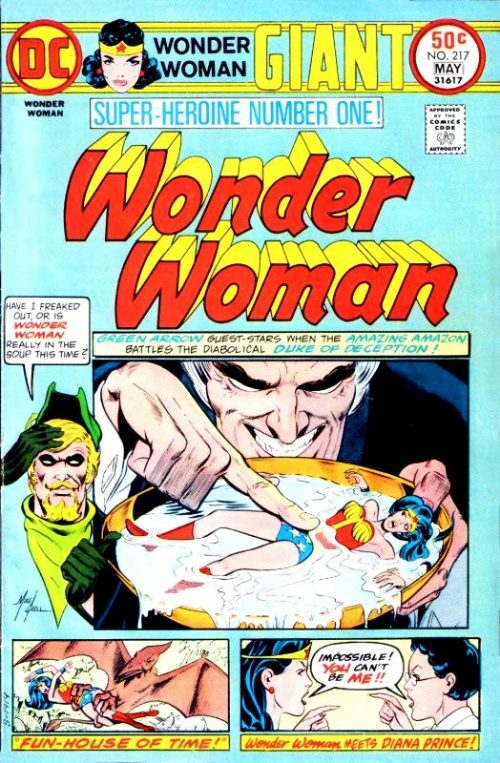 Once more, Diana looks at him completely bewildered and wonders if this is the the reason she had not been summoned to any JLA meetings of late. She tells Clark that she cannot remember any of the events he had just described and the Kryptonian realises that something is terribly wrong. 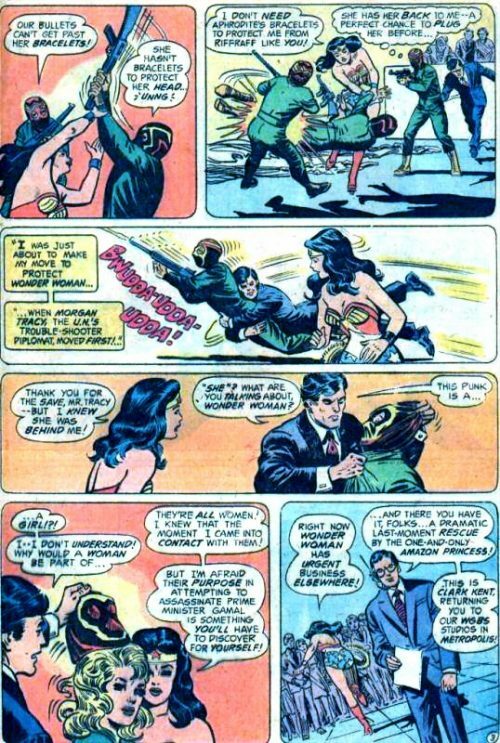 He tells her to change into Wonder Woman and go to the JLA Headquarters, where he will meet her there as Superman. So, a few moments later in a nearby narrow alley, Diana twirls her magic lasso about herself and transforms into her Wonder Woman costume. She swiftly boards her invisible jet and roars off into the sky. 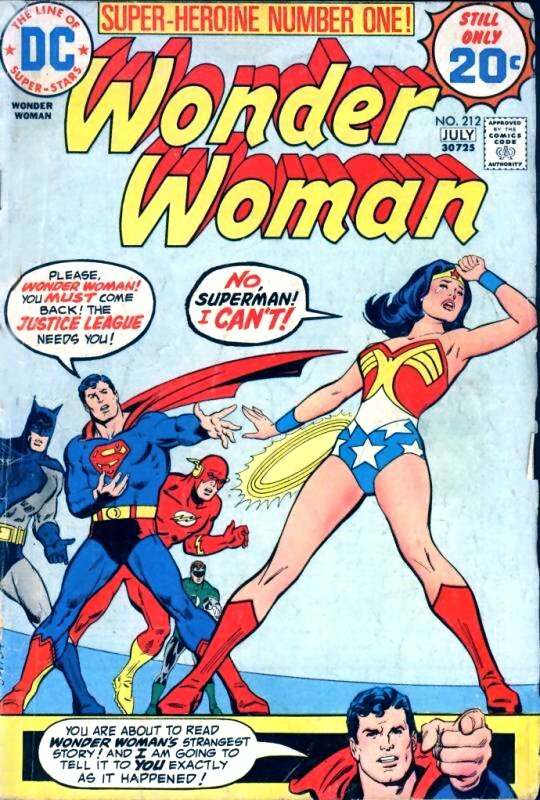 A few minutes later, when Superman arrives at the JLA satellite Headquarters, he is met by Flash who tells him that Wonder Woman never arrived. As The Man of Steel ponders why, he suddenly has an idea and flies off to the moon. 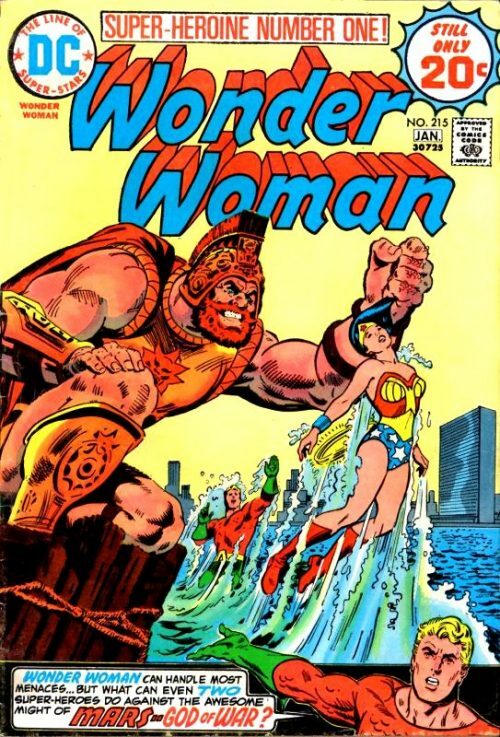 There, he finds the Amazon Princess standing amongst the shattered ruins of the old abandoned JLA Headquarters, her face full of fear and confusion. Superman confirms to her that the JLA have not met here for months and she desperately tries to understand why on earth she would have thought they still did. 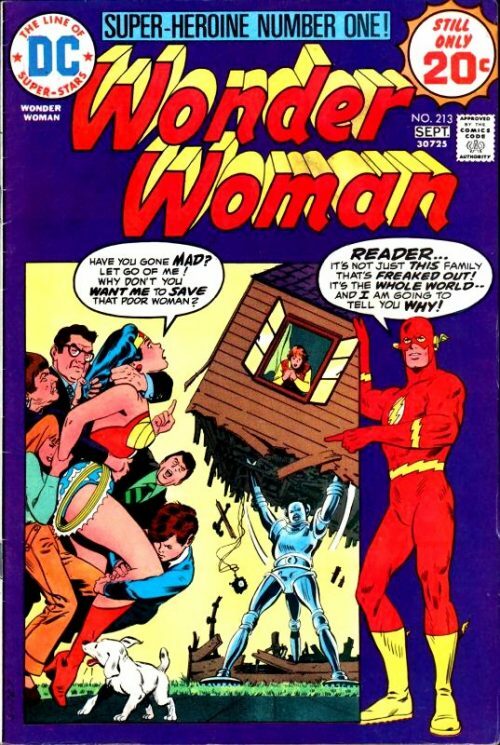 He hugs the distraught Amazon in her turmoil and swears to her that the JLA will do everything to find out! Later, back at the new JLA Headquarters, Superman, Batman, Flash and Green Lantern discuss with Wonder Woman what to do next. Batman tells her that as far as he can tell, there is nothing actually wrong with her memory – simply that she has no recollection of the past few months. She angrily replies that she is not prepared to accept his statement that she is in ‘perfect’ condition, since a big chunk of her past is still missing! She demands to know about I Ching, the blind old China man who became her mentor according to them, as well as finding out what happened to her ‘poor, sweet, darling Steve’ (Trevor). She tells the others that she has far too many questions than she can possibly cope with and that she will not rest until she has all the answers. Superman asks her to calm down, trying to reassure her that now she is back in the JLA, they can find out the answers together. She replies that she would very much like to consider herself back in the JLA, but that she cannot rejoin with her memory half missing. As far as she is concerned, she no longer deserves to be a member. The others begin to protest, telling her that the JLA needs her, but she counters that there is no guarantee that she might not also forget an assignment during some life and death mission, thus endangering the others. As she reconfirms her decision not to stay though she suddenly has an idea. She tells them that she will rejoin, but only if she proves herself worthy by performing twelve tasks, much like the twelve labours of Hercules. She asks the JLA to monitor her next twelve adventures and if she succeeds in resolving them to their full satisfaction – then, and only then, will she rejoin! 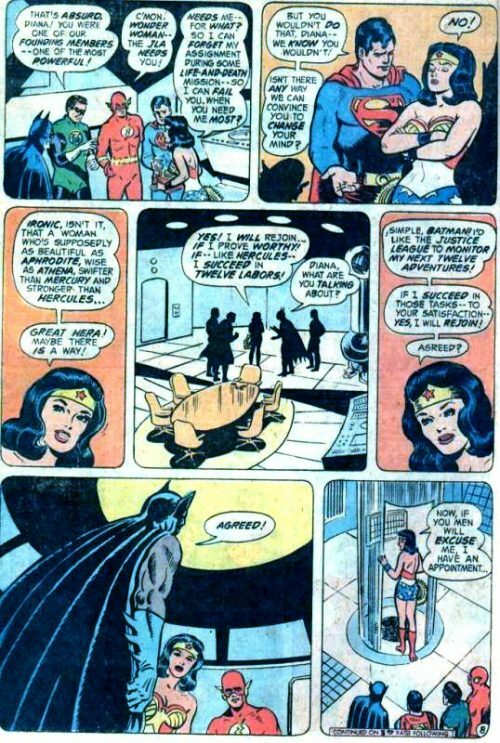 They agree, and with that, Wonder Woman departs, leaving the JLA to decide who will be the first to supervise Diana’s initial task. Flash suggests that Superman be the first, as it was he who brought the problem to their attention. He protests, saying that he is too sympathetic towards Diana to be objective. 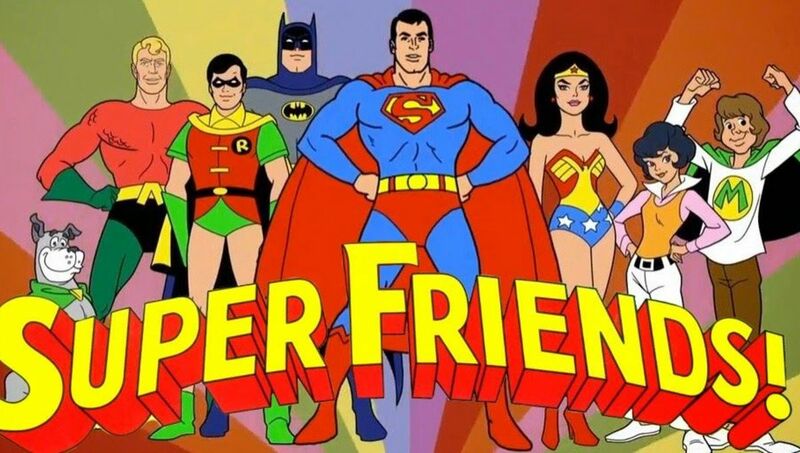 Batman reassures him that he is too much of a professional to let his objectivity be clouded and, as chairman of the JLA, orders Superman to take the assignment. An unhappy Superman then heads back towards earth while the beautiful Amazon Princess makes her way towards Paradise Island in her robot plane. As she lands, her mother, Queen Hippolyta, rushes out of the palace to greet her. But Diana’s tone is far from welcoming, as she announces that she has returned to her Island home to discover why her own mother has betrayed her! A horrified Hippolyta asks her how she could possibly believe such a thing and Diana in turn asks her why she has played havoc with her own daughter’s mind, because only Amazon technology was capable of producing the selective amnesia she now suffered from. 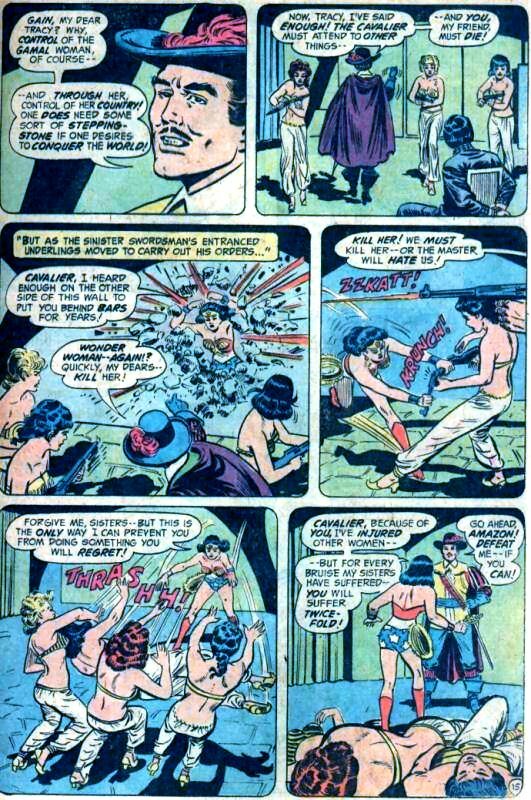 Hippolyta confesses that she has been hiding the truth and takes Diana to the Hall of Science. The queen explains that when Diana had arrived back on Paradise Island several months ago with her memory totally gone, they had no choice but to use the Amazon Memory chair to restore it. She tells her daughter that every memory had been restored, apart from the period when she had spent her time in man’s world without her special powers. This was because the Amazon’s records of this period were not complete and it would have been wrong to preserve only half memories. Diana angrily rebukes her mother, saying that it was not their decision how her life should be recollected. She demands the missing memories be returned so that she can find out what happened to Steve Trevor. Though Hippolyta hates to do it, she reveals to her daughter that Steve Trevor is dead! She tells a stunned Diana that the Steve she had shared the past few weeks adventures with, was merely a mentally induced substitute, designed to maintain her psychological stability! 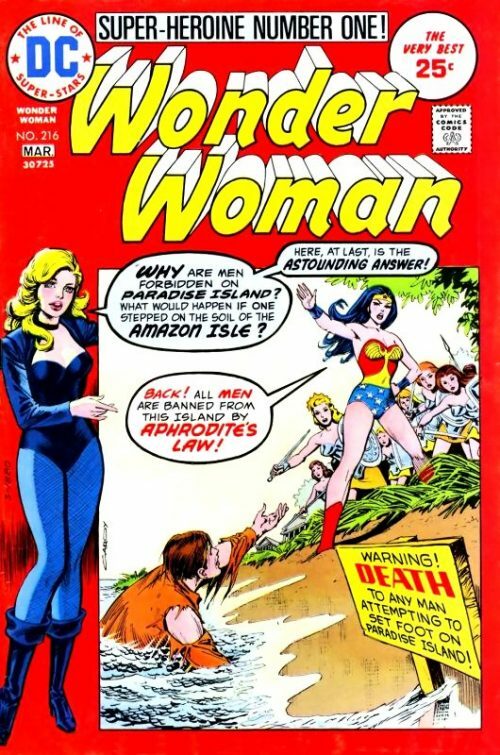 With the truth revealed to her, Wonder Woman pulls herself together and summons her invisible plane, leaving Paradise Island feeling more of a stranger than she has ever felt before. She returns to her New York apartment and changes back into her Diana Prince alter ego, thankful that she had recently decided to get a place of her own instead of staying with her UN flat mates At this moment she just wants to be alone. As she stares at a photograph of Steve on her mantelpiece, she muses to herself how much of a joke she is – this new Diana Prince who was supposed to be so self reliant, liberated and socially aware. “Aware of what? !” she cries out and karate chops the picture, smashing it into pieces! She realises that she must find some sort of a distraction before she drives herself over the edge and decides to phone Morgan Tracy to tell him that she wishes to accept his job offer. But when she dials his number the voice on the other end tells her that he has gone out for the evening. When she replies that it is important that she speaks with him, the stranger tells her to go to the Casbah Club. Diana knows that the Casbah is a swanky new nightclub, although it does not strike her as the sort of place you would find a man like Tracy. However, undaunted, she decides to go there. Meanwhile at the Casbah itself, Tracy is sitting at a table drinking with Prime Minister Gamal. He tells her that a place like this does not seem quite the place to entertain a visiting head of state! She replies that he has been tasked by his government to entertain her however she chooses, and she has chosen the Casbah Club. Just then the manager of the club walks over and greets the Prime Minister, asking her if everything is satisfactory. As she replies that everything is fine, her and Tracy suddenly find themselves disappearing down a secret shaft which opens up beneath their seats. As the manager watches the now empty seats slide back into place he smiles to himself and walks away. Outside, Diana has arrived at the club’s entrance and although she feels that she should not be bothering the UN troubleshooter on his night off, is still compelled to carry on. However, as she reaches for the door handle she begins to feel uneasy and realises that there is something wrong here. Quickly, she darts down a side alley and transforms into her Wonder Woman costume. At that moment, underneath the Casbah, Tracy has been bound to a chair and is demanding his female guards to release Prime Minister Gamal. The manager enters the room and reveals himself to be a villain known as the Cavalier. He tells Tracy that the UN troubleshooter should have been killed during the faked attempt on Indira Gamal’s life and that now the Cavalier will have to kill him here at the Casbah instead. Then, he will have to go through the bother of convincing Indira Gamal that it was Tracy and the United States who were responsible for the assassination attempts. The Cavalier smirks that this should not be that difficult as he has a remarkable way with woman. The Cavalier reveals that he plans to control Indira, and through her, control her country as a stepping stone to rule the world. Then he instructs his female gang members to shoot Tracy but as they prepare to fire, Wonder Woman smashes through the wall! She quickly disarms the surprised woman and knocks them out. She confronts the Cavalier and tells him that because of him, she has had to injure other women. But for every bruise her sisters had suffered, he would suffer twice fold! He goads the Amazon to defeat him if she can. She replies that she knows he uses women as pawns but she is one woman he cannot control. As she speaks, however, she begins to stumble on her words and the Cavalier softly tells her to look into his eyes. He smoothly tells the entranced Wonder Woman that he is the sort of man she has always dreamed of and that she loves him. High above the Casbah meanwhile, Superman watches the scene with his x-ray vision and prepares to save the hypnotised Wonder Woman. But his faith in the beautiful Amazon Princess is rewarded as she breaks free from the Cavalier’s spell and slaps him to the ground. A stunned Cavalier cannot believe she has not succumbed to his chemically heightened sensual attraction and getting to his feet, he draws his sword. He tells her that once she has been disposed of, he will be free to deal with Diana Prince, whom he had tricked into coming to the Casbah to find Tracy. As and when she arrived, he would make her become his spellbound mole in the UN Crisis Bureau. He then fires an electron bolt from the tip of his sword but misses the fast moving Amazon. She informs the Cavalier that Diana Prince had suspected something was wrong and had contacted Wonder Woman to go in her place. She then uses her lasso to disarm the villain, who in a last ditch attempt to stop her, removes his hat, from which razor pointed plumes fire out. In response, she removes her golden tiara and throws them at the oncoming poisoned darts, knocking them out of the air and onto the floor. She tells him that this is only a sample of what she can do to a male chauvinist. He replies that he is offended by the smear and that he does not just believe in man’s superiority – he is convinced of it! As he speaks, he tries to remove a specially treated snuffbox to use on the Amazon Princess but she anticipates the move and blows so hard that the snuff powder erupts into his own face. 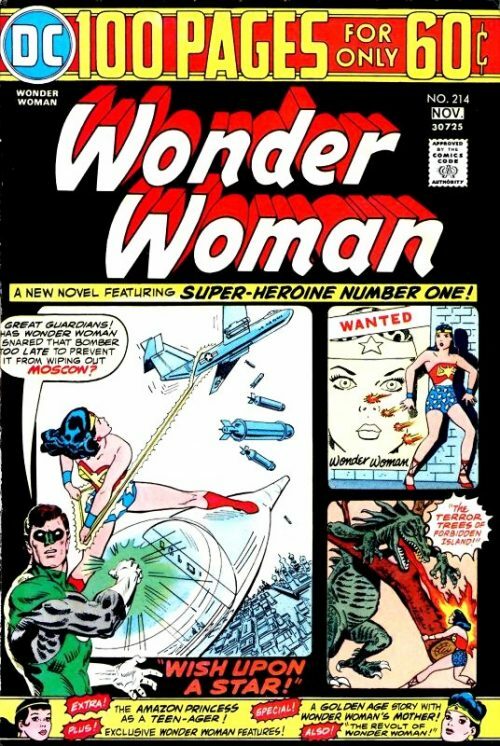 The story then returns to where we started, with Superman confirming to his fellow leaguers that Wonder Woman had passed the first trial – and that the heroine in her had overcome the woman who had fallen under the Cavalier’s spell. Batman agrees, although he tells Kal-El that he finds it a little hard to swallow that Diana had experienced some sort of woman’s intuition when she initially arrived at the Casbah. Superman then admits that he had done a bit of subliminal super ventriloquism to help his friend in need. Superman then decides to nominate a new ‘volunteer’ to monitor the second trial and, getting his own back, chooses the Flash!